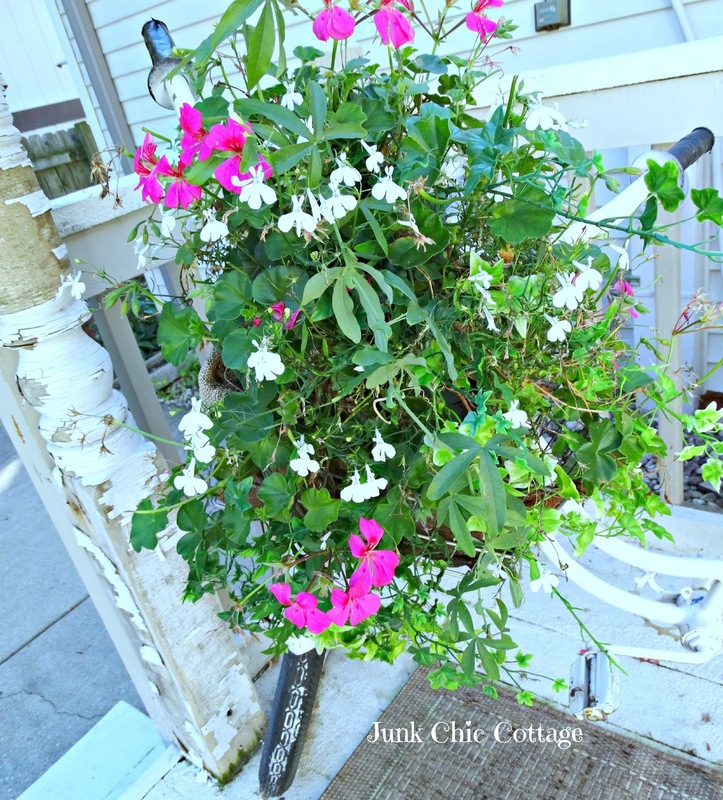 Junk Chic Cottage: Fall is in the Air but Summer Flowers are still Holding on! Fall is in the Air but Summer Flowers are still Holding on! It says fall on the calendar and fall is in the air with cooler days and nights. My summer flowers just do not want to let go just yet. My ivy geraniums are hanging on and the passion flower plant while not budding anymore is still green and lush. 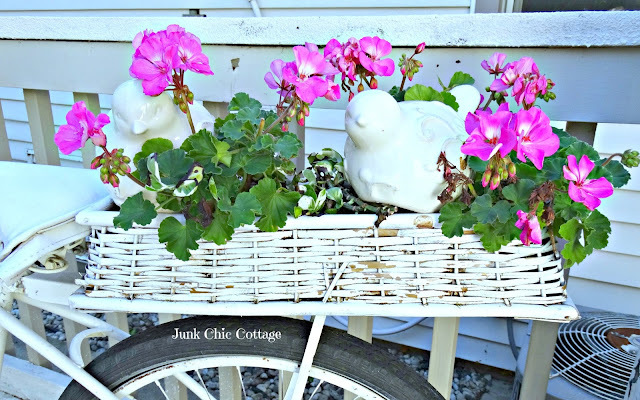 The geraniums are still popping with pretty color. My knock out roses are still blooming with lots of buds ready to open. My deck boxes still are having a few blooms and the greenery is holding on. It won't be long and there will be frost on the pumpkins and the flowers will be done for the season. I am holding on for just a few more weeks of enjoying these pretties. A little fall mixed in on the front porch. Hope you all have a wonderful start to the new week ahead. Same here! They just do not want to quit! I hope your week past was encouraging, and the week ahead with good news, Kris. 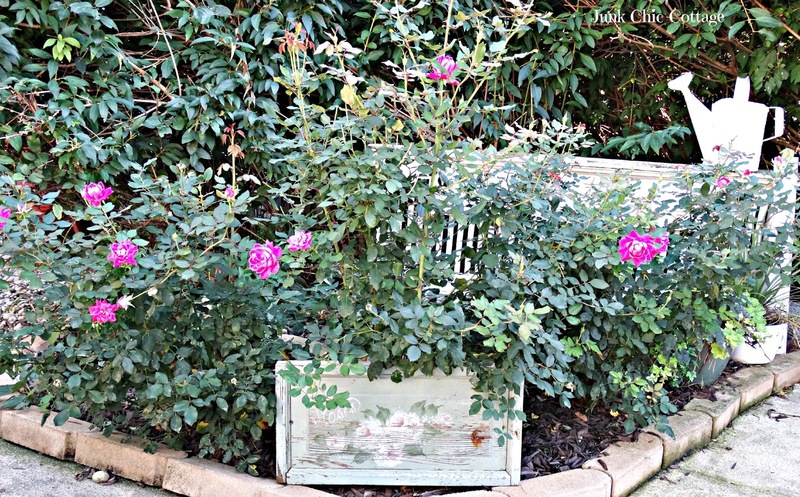 It still looks like summer in your gardens, Kris! My flowers froze this week, so today I've got to go out in the cold and empty my pots for the season. Enjoy those last blooms! Amazing as ever !! I can't wait to see what you and Terry do to that new house to make it a home when you purchase it !!! Your flowers and plants are beautiful. How great that they are still blooming! The first few photos you'd never believe it's Fall... Now the white pumpkin photos were a reality check! Always pretty flowers you grow with love and care. They still look pretty! 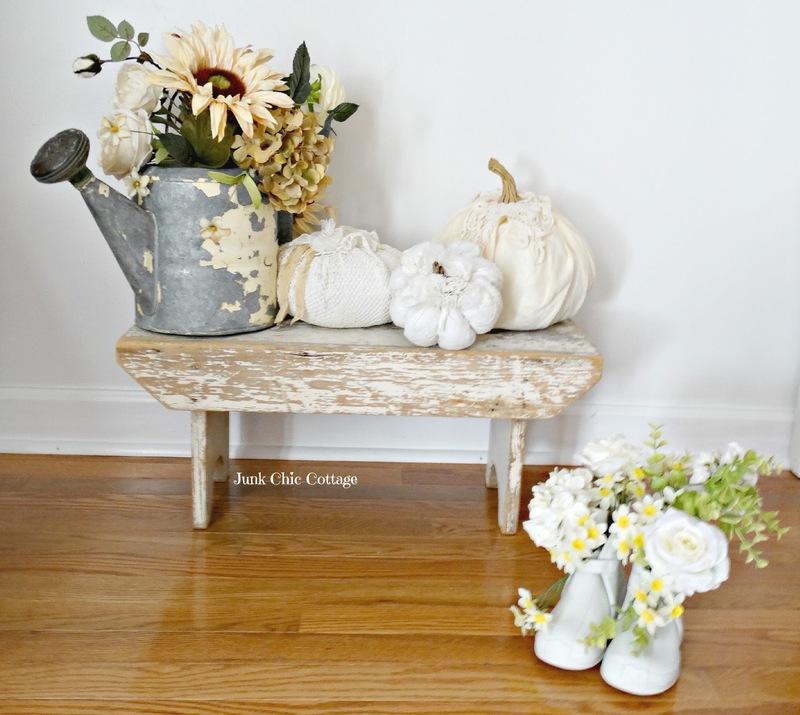 I love the pumpkin and the boot vignette. So pretty and you have a green thumb for sure Kris! So beautiful, Kris - sad to see it all go, but every season has its on beauty! My plants are doing well too and I stopped taking care them around labor day. Maybe that's the secret! Love your pretty pumpkins too. Enjoy the cold and cloudy Sunday! Jane ps, did you make it to Elkhorn last week? It sure was crowded! I would hang on to them as long as possible - so beautiful! Our flowers are rejuvenated now that the heat is finished. My impatiens are gorgeous again. Our average frost date is October 18th but we usually hold off until November for a freeze. Your flowers are beautiful. Your flowers look amazing!!! Most of mine are hanging on but look haggardly.....except for my geraniums which is odd. 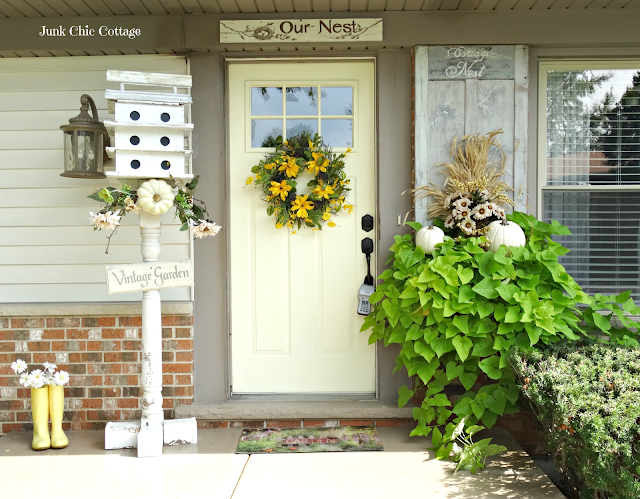 Fall on your front porch is lovely, Kris! And those ivy geraniums! I want to try them next year. Your flowers still look so pretty. I too will miss the summer flowers when the frost comes. Your flowers are still gorgeous. Ours are really drying up and beginning to brown a bit. We haven't had much rain lately and it shows. Your flowers are holding up much better than mine! Love your boxes on the railing. What is the handing plant? Kris, your flowers are still very pretty. So glad that they are still hanging on. We actually got a little rain, very little today. The plants looked that they were dancing with delight. No A/C today, yea. Have a terrific week and enjoy your lovely flowers. the front of the house looks good with your Fall decorations. We also have enjoyed a great September.We did not have a frost until this weekend. I love how you decorate with the flowers and pumpkins. My flowers are looking better than they did all Summer with all the dry heat we had. The air is getting chillier and the sun set way too soon, but I also get to enjoy all the beautiful Autumn color nature provides. Wishing you luck on selling your home! Your flowers are looking beautiful. We are having and warm fall which is lovely. 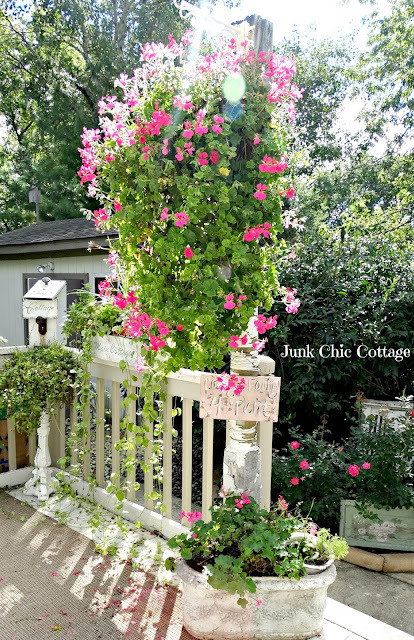 I really enjoy your outdoor decor; love it. Your plants and flowers are stunning! Hi Kris, your fall touches, to yet still summer blooms, is beautiful. So pretty and inviting. 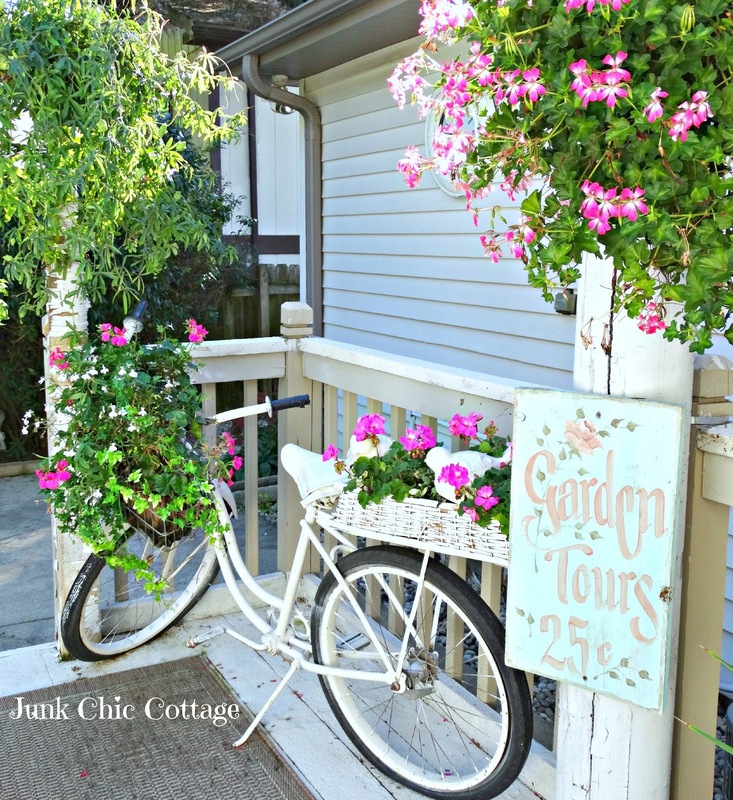 Love your front porch and the welcome it gives. It all looks so beautiful Kris. We've already had a light frost so it was time to remove the summer planters. Yours still look amazing! You've got the Midas touch it seems Kris. My flowers went kaput last week. We had a lot of sweet potato. 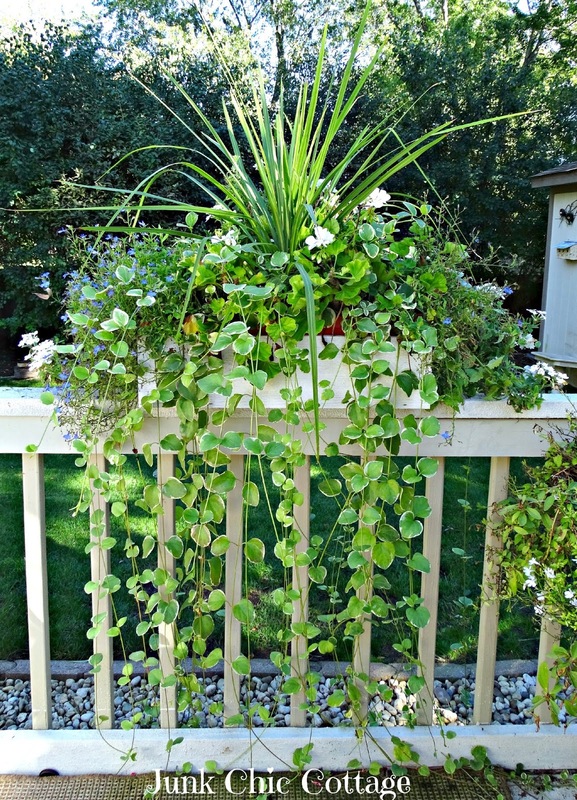 I especially in containers and as nice as they are they are known for not holding up well in cool weather...and it IS cool now! That should read 'we have a lot of sweet potato vines in containers'. Wow you're flowers sure do look amazing still. I've long pulled mine and added in my fall mums (things were looking pretty scraggly around here). Today is a little warmer so I hope to get some things done outside and it feels like the wind is down. It's been blow me over windy here for a week. So sorry for not stopping by your blog Im having big internet issues and can't surf much right now. Well when you have flowers that look like that, then you SHOULD be hanging on to them as long as you can! They are all so pretty. All of your flowers are absolutely gorgeous!! It has been a little chilly down here also, but flowers and plants are hanging on. Seems that they want to squeeze everything they can out of summer! Just gorgeous Kris!! Hope your week is off to a great start!! Hugs!! Your flowers still look amazing, Kris! We've finally had a break in temperatures and rain, so it looks like a bright week ahead. Your flowers look beautiful, my petunias are kicking it into gear with the cooler weather. I live in IL also, and my cousin lives in Lake Zurich, small world. I wish you a speeding sale on your home! Living in Illinois too, I know, my summer flowers are still hanging on. I emptied my front planters on the weekend just so I could plant the mums, felt bad emptying a planter that was still blooming...but my mums were going to kick the bucket if I left them in the store pots for too much longer. And now I see that we will get up into 70's again...weird fall so far. 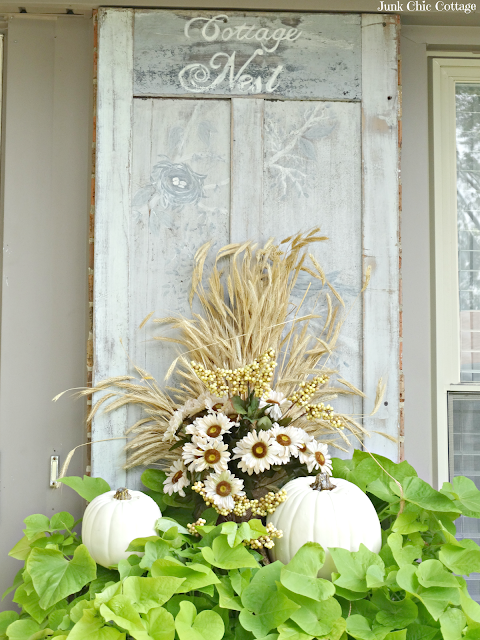 Love how you added touches of fall in a neutral way. It looks beautiful mixed in with your summer flowers. I'm hanging on to Summer as much as I can too, Kris. I just lost my impatients to frost the other night but my geraniums, roses, and million bells are holding out strong so far. Finger's crossed you get several more weeks of blooms Kris. Gorgeous! It's rained 12 days straight here. The sun finally came out today. It's still warm... I'm so ready for colder weather. Hoping all is well with you! I've been working on a few projects. If only I could create without making a huge mess. My kids call it the mom bomb... Happy Tuesday! My summer flowers are barely holding on, except for the sweet potato vine, which is going like gangbusters! All of yours still look lush and lovely! Oh my. Your flowers are still looking amazing. My garden is all brown and done for the season now. I love your knock out roses. They are beautiful. Wow....your flowers are still gorgeous! 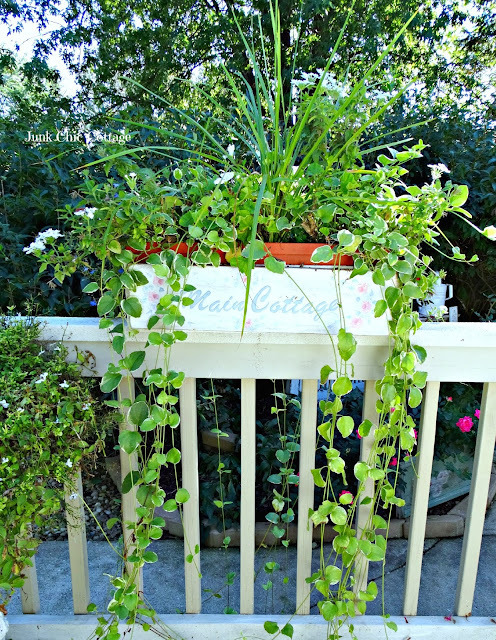 My summer plants are hanging on too...but it's been so dry and have been watering. Your flowers looks so pretty and so does your porch. My flowers seem to be doing ok as well - not as thick as they were but still blossoming ( I'm dreading the first frost ) sometimes I think the crisp evening air makes them fight even harder - some of them actually seem more vibrant ! These are really popular places in the city for private events for corporations like us. It can be hard to find the right venue for big events. The right size, that is flexible fits well. Thanks to venues San Francisco here.